Guardians of the Galaxy Groot Notebook | Premium notebook with official Groot voice! 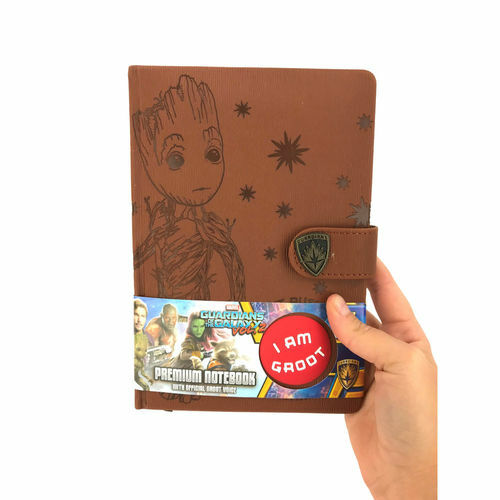 A premium notebook with official Groot voice! Whatever you do, don't press the red button..
Of course, you will. You'll hear Groot speak! Perfect for the office or classroom. Jot down your inspired ideas and doodles in this A5 Groot-inspired Notebook from Guardians of the Galaxy Vol.2! There's a galaxy of pages to fill with your plans, thoughts, habits, or even your family tree. Whatever takes your fancy! Coming complete with 110 lined pages with Groot and Rocket Raccoon decals in the bottom of each corner, you're sure to love the PU leather look embossed cover design. Held shut with a wrap-around magnetic clasp. your high quality notebook has a large red button on the front that says "I am Groot" when pressed! A5 size notebook (approximately half the size of an A4 piece of paper). Absolutely the cutest notebook ever! That red button is addictive!! Sounds just like Groot!